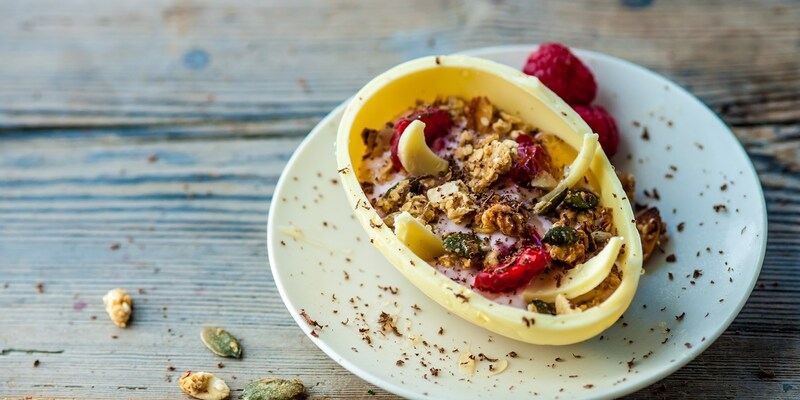 Easter is a lovely period for food - it is, after all, the holiday most synonymous with springtime and all the wonderful ingredients the season brings. Browse our collection of Easter recipes for some fantastic holiday eating ideas, from chocolate desserts to meaty Sunday lunches. Lamb is traditional Easter Sunday fare, and there is plenty of inspiration in this collection for a roast to remember. Chris Horridge's Lamb loin, Parmesan risotto and pan juices would make an exquisite family meal for the holiday, as would Alfred Prasad's Oven roasted rack of lamb. Alternately, one could always serve up an icon of springtime fertility and fecundity, the rabbit, with Phil Howard's Seasonal Saddle of rabbit with spring vegetables, pea shoots and tarragon recipe. As the shop aisles explode in an array of the sweet stuff, chocolate is something that cannot be neglected when discussing edible Easter treats. Marcus Wareing's Rich chocolate cake recipe would make an impressively lush finish to an Easter dinner, or - if you’ve lucked out with the weather - try Paul Ainsworth’s Chocolate sorbet recipe for a lighter dessert. Paul A Young wonderfully combines two Easter sweet treats in his innovative Hot cross bun recipe, a chocolate brownie adorned with a cross and carrying the glorious spiced fruit flavour of a traditional hot cross bun.